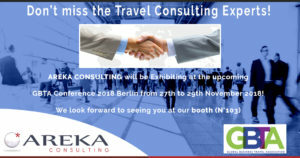 27 Nov Don’t miss the Travel Consulting Experts! from 27th to 29th November 2018! We look forward to seeing you at our booth (N°103) to share our latest innovations and industry insights. Contact us at pjungfer@areka-consulting.com to book an appointment and to meet our team at Booth 103!